Storm Shadow…Train hard, fight easy! Hands down one of the best things about the immensely popular 3 ¾ inch G.I. Joe: A Real American Hero line has to be that Hasbro invented a satisfying back story which included a fantastic range of villainous bad guys for the G.I. Joe Team to fight in the shape of the Cobra Command. Storm Shadow aka Thomas S. Arashikage here, however, is one of only a few characters whose allegiance has shifted back and forth over the years and who has been issued as both a member of team Cobra and a member of team G.I. Joe. 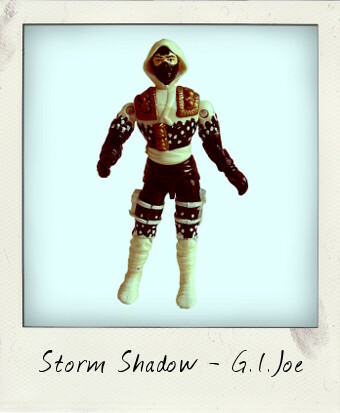 His first appearance in 1984 was as the Cobra Commander's ninja bodyguard, but in this, his third Hasbro outing as part of the eleventh series from 1992, he is very much back with G. I. Joe as leader of the Ninja Force sub-series. This is probably my favourite vintage version of Storm Shadow – the attention to detail on his “specialized chameleon camouflage battle uniform” is superb – I just love the snow blizzard / cake icing look, and as always there's plenty of detail in the mold too, with daggers strapped to his legs, gold trimmed insignia on his shoulders, and even puttees over his boots! He was issued with some serious gear - a huge white sword, white sickle, and cloth ribbons attached to his right hip – all of which my loose figure has lost, although his “Martial Arts Battle Action” still works perfectly. If you raise his left arm, his right arm moves back - release the left arm and the right arm springs forward to land a ninja blow! He's a little unsteady on his legs - the internal rubber O-ring washer linking his lower body joints probably needs replacing - but can still be posed long enough for a photo shoot without toppling over! Seriously - what not to love about this figure!? Collect them all...you know you want to!